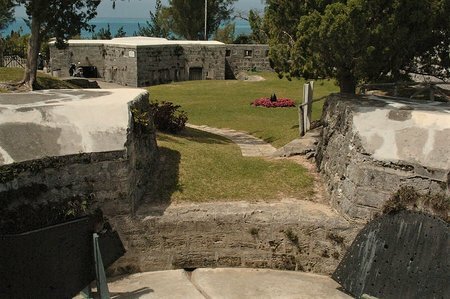 Fort Scaur is located at the western end of Bermuda in Somerset and on the highest hill top. You can reach the fort by bus #7 or 8 from Hamilton city. This fort was built in 1870s at the time when the relationship between British and the Americans were strained. The fort was built in such a way that it was barely visible from the sea. The idea was to save the Royal Naval Dockyard, the largest naval dockyard in Bermuda and protect it from any possible land attacks. This was the time when the British thought that the Americans may try to seize the Dockyard and use it as their port. It's an inland fort that was built to defend any land based attacks from the south shore. Ironically, although British soldiers were posted at the Fort Scaur during the World War-I, during the World War-II American soldiers were stationed here. After all Britain and U.S finally became allies during the world wars. Fort Scaur had 64 pound guns mounted on disappearing carriages. The guns and cannons no longer exist. The fort has subterranean passages and a huge dry moat. There is a free telescope at the fort. From there you can see landmarks far away at the eastern end like the St. Davids Lighthouse and the St. Catherine Fort that are located at St George's. Stand on the rampart and you will see the Atlantic on one side and the Great Sound on the other. The view of the Great Sound from here is amazing. The Fort Scaur covers an area of 22 acres of parkland filled with nice trails, picnic areas, a rocky shoreline for fishing, and a public dock. There are picnic tables, benches, and restrooms in the fort premises. There is no admission fee at Fort Scaur. 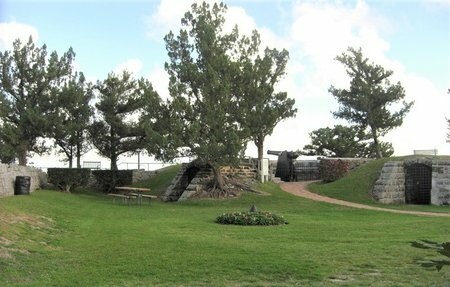 The fort is open daily between 10 a.m. to 4:30 p.m. The grounds outside stays open until sunset. 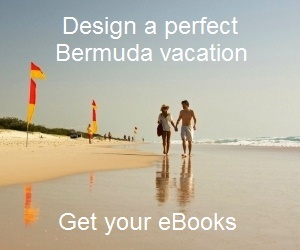 Check out Bermuda Tourist Map to view the location and other attractions around. 3) Check out Sandy's parish to find out other great attractions in the parish.